1897. Great Northern Railway Bridge over the river Don. Richard Johnson (1827-1924), M. Inst. C.E., Chief Engineer for Great Northern Railway. 1840 Apprenticed to a builder and contractor as a carpenter. 1847 October. Appointed to the staff of Brydone and Evans, engineers to the GNR. 1859 Became responsible for the direct Peterborough to Doncaster line. 1861 June. Appointed engineer for the GNR when Walter Marr Brydone retired (with Joseph Cubitt as Consulting Engineer). He observed the Welwyn tunnel accident and fire. He was in charge of constructing the Derbyshire Extension Railways, notably the viaduct at Ilkeston over old coal workings, the curved viaduct at Gilbrook, and the long Kimberley cutting. He was also involved in the Newark Dyke bridge, the Don bridge, the Copenhagen tunnels, and the bridge over the GER at Peterborough. Richard Johnson was a teetotaller and was involved in missionary work. 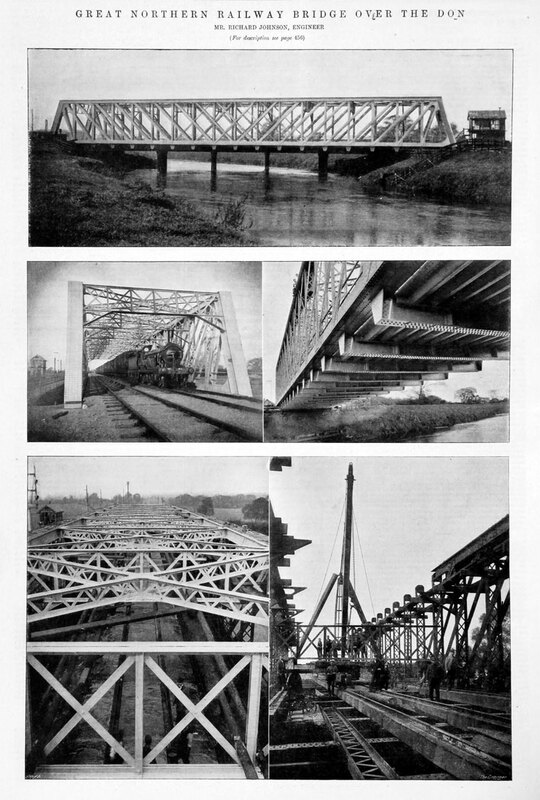 His son T. R. Johnson was also an engineer and was responsible for moving a new bridge into position at Peterborough. This page was last edited on 16 September 2015, at 14:36.